The importance of this study should not be underestimated. The ability to rule in (diagnose), or rule out, Alzheimer's disease is critical. A person could present with dementia like symptoms but be suffering from an illness or disease that can be treated. Doctor often diagnose Alzheimer's without an MRI, and more usually, without a PET scan. It is a simple matter of dollars and cents. The tests are expensive and healthcare providers don't want to pay if it can be avoided. As part of the diagnosis, did your loved one receive an MRI and/or a PET Scan? Use the Add New Comment box below this article to answer this question. Why is a correct diagnosis of Alzheimer's critical? Because it is difficult to differentiate memory loss caused by Alzheimer's from other causes of dementia like symptoms. Poor diet, dehydration, multiple prescriptions (side effects of medication) are among a long list of items that can exacerbate aging and make a person seem demented. In addition, dementia (Alzheimer's disease) like symptoms can be caused by numerous factors. The real question remains, Is it really Alzheimer's or Something Else? The something else in the equation can often be treated effectively. As many as 20 percent of persons diagnosed with Alzheimer's have been misdiagnosed. Did your doctor rule out the other causes of dementia like symptoms as part of the diagnostic process? The team determined that the ASL-MRI test is a promising alternative to the current standard, a specific PET scan that requires exposure to small amounts of a radioactive glucose analog and costs approximately four-times more than an ASL-MRI. Two studies now appear in Alzheimer's and Dementia: The Journal of the Alzheimer’s Association and Neurology. 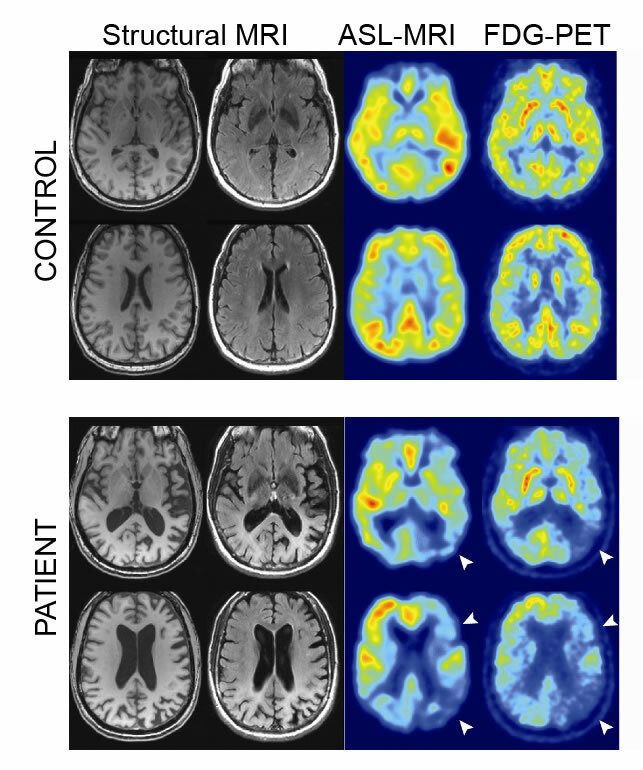 The studies being reported this week show a comparison of ASL-MRI and FDG-PET in a group of Alzhiemer’s patients and age-matched controls. 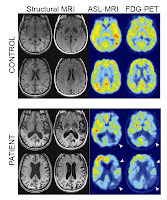 Cerebral blood flow and glucose metabolism were measured simultaneously by injecting the PET tracer during the MRI study. The data were then analyzed two different ways. Study collaborators from Penn included Erik S. Musiek, MD, PhD; Marc Korczykowski, Babak Saboury, Patricia M. Martinez; Janet S. Reddin, PhD; Abass Alavi, MD; Daniel Y. Kimberg; Joel Greenberg, PhD; and Steven E. Arnold, MD. An additional researcher from and Astra-Zeneca also contributed to the research. The study was funded by grants from the National Institutes of Health's National Institute of Neurological Disorders and Stroke (NINDS), National Institute of Mental Health (NIMH) and National Center for Research Resources (NCRR), as well as a grant from the Penn-AstraZeneca Alliance. 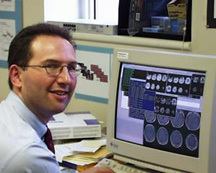 Dr. Detre is an inventor on the University of Pennsylvania's patent for ASL-MRI. Penn's Perelman School of Medicine is currently ranked #2 in U.S. News World Report's survey of research-oriented medical schools and among the top 10 schools for primary care. The School is consistently among the nation's top recipients of funding from the National Institutes of Health, with $507.6 million awarded in the 2010 fiscal year.